Glass has sufficient enough density that the added thickness in the image of the extra glass particles is material enough to be seen. The specific gravity of glass particles in the product differs materially from that of food or beverage products, which have a specific gravity close to 1. 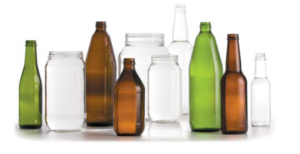 Understanding the specific gravity of your glass containers is critical to ensuring that challenge samples used to testing will actually capture expected real-work inspection performance. Modern glass inspection techniques use Empty Bottle Inspector (EBI) to inspect glass containers before filling. Then, a Full Bottle Inspector (FBI) will X-ray filled glass containers. EBIs use”vision technology” to ensure that there are no exterior finish defects in the container, and to verify that the interior is free from foreign material. FBIs focus solely on detecting foreign material. Ideally, FBIs are used immediately after the filling and closure process. This ensures that in the event of the filler or the capper damaging the containers, the least amount of defective containers are produced before the problem is resolved. Glass containers widely vary in container dimensions, which is directly attributed to the manufacturing process. Each mold used in the manufacturing process is unique, and so there are considerable mold-to-mold variations in the finished container. Glass shards are by definition asymmetric objects – one dimension of the shard is often very small. Reliably detecting these types of contaminants requires more sophisticated multi-beam imaging systems. 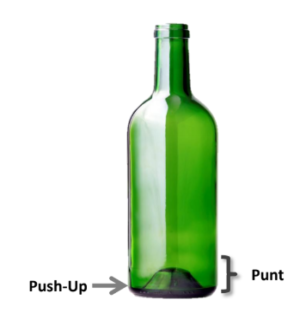 “Punts” or “push ups” are typical in glass containers, which can obstruct X-ray imaging. Thicker walls on glass bottles can also require high levels of X-ray power, risking “image wash-out” of contaminants during an inspection. Speed: Glass lines can operate as fast as 1300 containers per minute; therefore, inspection and rejection equipment must be extremely fast (and yet not break the container during the inspection process). Additionally, because glass containers are generally taller than they are wide, a side-view X-ray inspection architecture will produce the best inspection. Side-view glass systems also have more powerful imaging sources, which allows them to more properly expose glass containers. 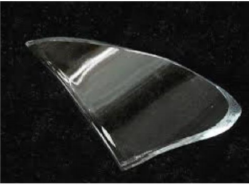 Asymmetric glass shards are best detected using multiple beam system. The container walls usually have a thin dimension; and the lengthwise dimension is slightly larger. 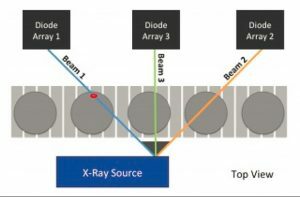 This means that single-beam X-rays may not being able to detect a shard from every direction. They leverage various imaging geometries, which greatly increases the probability of finding asymmetric components. They are critical in imaging around the punt in the bottom of the container. The extra glass forming the push up reduces imaging and so special techniques are needed to address this shortcoming. It’s exceptionally important to ensure that test pieces used for challenge tests are the appropriate density. In the X-ray industry, there is a wide use of test results using “high mineral glass”, which has a specific gravity much greater than soda lime glass. While the detection of high mineral glass can be impressive, high mineral glass is not naturally occurring in any food and beverage production environment – and so test results from high mineral glass are meaningless. Challenge testing for glass applications must be done using Type P or Type M soda lime glass. 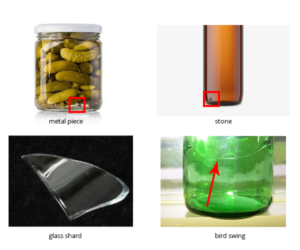 These test pieces most accurately represent the type of glass used in glass container construction, and so test results will most closely replicate actual shard detection performance. One of the inherent benefits of using X-ray inspection technology is traceability. An image of a container is generated and stored; if a contaminant is reported, the X-ray image can be reviewed – “traced back” – to determine if the contaminant was present at the time of inspection. Since there can be considerable variations in dimensions from container to container, sophisticated inspection software is required to ensure the variations do not cause false rejects. In the most basic sense: the software needs to remove the container walls from the image and determine if any of the remaining image has contaminants in it. While conceptually simple, this is a complex process, requiring sophisticated software engineering. Good false reject performance on glass containers is 4 false rejects per 10,000 inspected containers. Peco-InspX is developing approaches that will reduce the false reject rate to 1 per 100,000 inspected containers. Both systems are state-of-the-art X-ray tools for inspecting glass containers that are designed for specific applications. 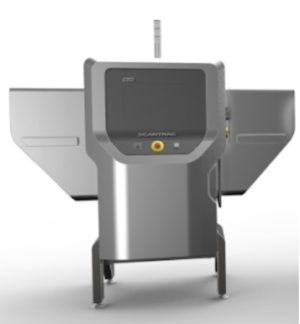 The SHIELD Trio is a unique triple beam glass inspection system – it uses a single 600W X-ray tube to obtain 3 distinct X-ray beams, making the Trio much less expensive to own than competing X-ray designs. The triple beam design offers superior detection of asymmetric glass shards as each container is imaged 3 times from distinct geometries. This design is fundamental to “seeing around the dimensions of the push up” in the bottom of the container. Additionally, the Trio has a center beam that is perfectly perpendicular to the container, which allows for extremely accurate fill height and headspace measurement. Because the Trio sits over the customer’s existing container, it is completer non-contact and requires no container transfers; which makes adding the Trio to existing plant operations easy. However, the Trio does require approximately 0.5 container diameter spacing between successive containers to prevent image overlapping during the inspection process. The SHIELD Glissando uses a different inspection architecture than the Trio that images from the top through the bottom of the container – this allows the machines to see directly over the container punt. To provide multi-geometry inspection, the machine has approximately a 12 degree separation between the twin detectors imaging the bottom of the container, which are imaged using a single X-ray source. Because the Glissando images through the bottom of the container (where there tends to be less container variation than in the sides), the Glissando series tends to achieve better inspection performance than the SHIELD Trio. However, this improvement does come with some operational expense. Unlike the Trio, the Glissando requires that containers be transferred onto the machine’s internal conveyor (whereas the Trio sits directly over the customer’s conveyor). The Glissando conveyor uses a special high-tech belting material to aid in the container transfer and to ensure maximum imaging performance through the bottom of the container. The Glissando architecture does not require spacing between adjacent containers. In fact, back-to-back containers can be literally touching. The Glissando series is also available in a large container format system called the “Glissando Plus”. The Glissando Plus is the only X-ray inspection system on the market that can completely image a U.S. gallon-sized glass container. To image these containers, the Plus adds a secondary beam that is mounted on an electrically-adjustable track – so that the beam can be optimally positioned. The twin X-ray sources give the Glissando Plus 1200 watts of X-ray power, making it the most powerful food and beverage X-ray inspection system on the market. A good inspection provider can work with your glass supplier to improve the quality of your glass containers in addition to ensuring the root cause of any contamination that happens during the production process. When deciding to invest in glass inspection X-ray technology, think of it as a partnership rather than a one-time purchase. If complications arise, your partner must confidently provide a solution. 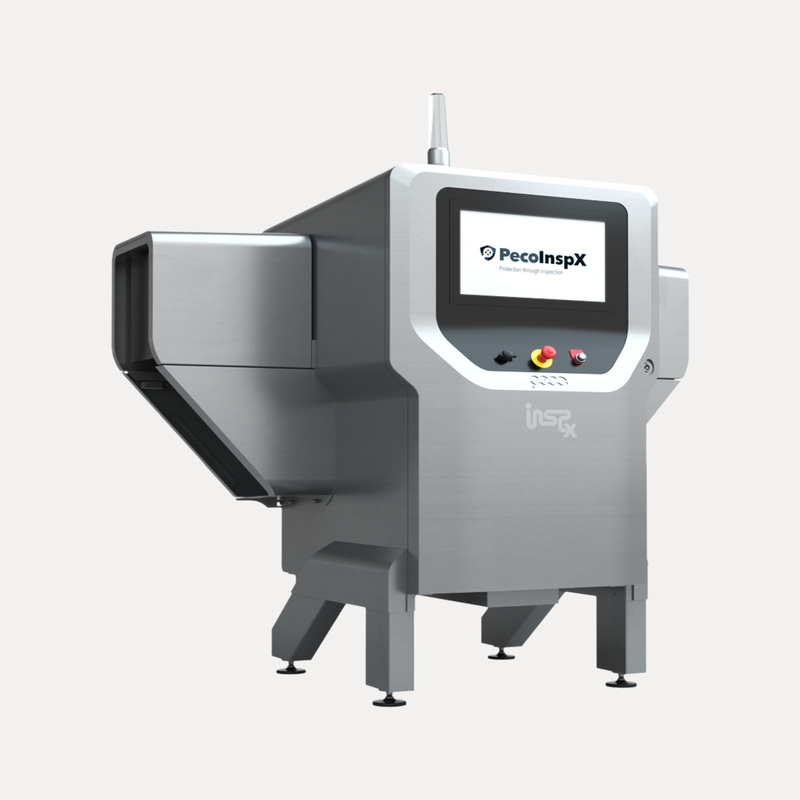 If you’re interested in a demo of how Peco-Inspx can help your glass inspection process, watch our full product demo video and fill out the form on this page.